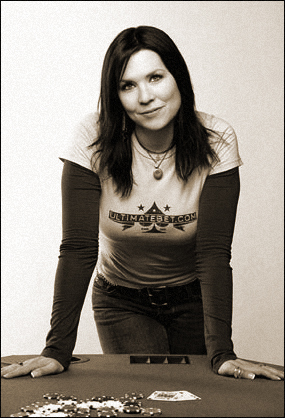 Annie Duke isn’t your typical poker player. As if being a woman in a male dominated sport wasn’t tough enough, Duke has to juggle raising four kids with a life on the road. As poker’s popularity continues to explode, so does Duke’s success. In 2004, she won $2 million in the World Series of Poker Tournament of Champions (that’s a lot of poker chips) and her first WSOP gold bracelet. She also wrote a book during that time called Annie Duke: How I raised, folded, bluffed, flirted, cursed and won millions at the World Series of Poker, which was just released a few months ago. Recently, Duke was nice enough to take some time out of her busy schedule to talk to us about the life of a professional card player. Poker is as popular as ever, but it’s unlike any other sport. You’ll never see an “Average Joe” play in a NFL game, but in poker, anyone can pay the entrance fee and play against the pros. Do you see this as a good thing or a bad thing? I think it’s a great thing. There are events where only pros are invited, so you do have some of that, but the fact that there are a multitude of tournaments where anyone can enter, I think makes it a great game. I think it’s really good for the game and it keeps it popular because everybody feels like they can have a chance and they can interact with the people they see on TV. Playing off of that question – more and more people enter the World Series of Poker each year. With so many amateurs joining the competition, is it easier for pros like you because there’s that many more individuals who don’t belong, or is it tougher just because of the sheer number of competitors? The World Series is a very particular event. You’re not going to see a pro win that. There might be 50 pros that you can name and there’s 6,000 people entering. So, one of the 5,950 people is probably going to win the event just by sheer mass. But, the fact is that not every tournament has 6,000 people in it. So having this one tournament that’s so huge where first place is seven and a half million is great for poker. Anything that’s good for the game is a great thing for me, for everybody. It would be frustrating if every tournament had 6,000 people in it. They have it scheduled for the main event to take 13 days next year. But it’s a once a year thing. It’s a cool spectacle once a year to see all these people, this vast humanity, stream into a room to play poker for $10,000. But every tournament isn’t like that. I play plenty of tournaments that have 200 people in them. Do you think poker is going to continue to grow in popularity or do you think this is its 15 minutes of fame and the bubble will burst at some point? I don’t know that you’ll see as much poker on TV as you do today, but poker is never going to go away. Look, there’s a reason why golf remains on TV and it’s because so many people play golf, so when they’re watching it, they can relate to it. Poker is the same way. The issue that made poker not be on TV before was that they couldn’t figure out a way to show it in a compelling way because they didn’t have the lipstick cameras. It’s very interesting playing poker when you know what your own cards are and you don’t know what everybody else’s cards are and you’re trying to figure out that information. When you’re watching a poker game where you don’t even know what anybody’s cards are, it’s like watching paint dry. When they changed the situation so you’re watching poker and you know what everybody’s hold cards are, that actually puts the audience in a superior position to the player. Now they get to go, “Oh, that’s such a bad bluff” or “Oh, what a great call” or “Oh, don’t do it.” It increases the drama. The thing that is going to make poker persistent is that the poker on TV didn’t create an audience. The audience was already there for it. Poker has been around for 160 years – all the way back to Wild Bill Hickock. Everybody plays poker. It’s on the Odd Couple with Jack Klugman and Tony Randall. It’s not something that was created by television, it’s something that television tapped into. While poker has a very glamorous image, your story is sort of unique because you are a mother of four playing poker for a living. What is it like to live that lifestyle? Obviously, I have a balancing act between my family and my career, so I play probably half to a third of the number of tournaments that my peers play because I need to be home with my children. When I am away, I have an ex-husband who takes the kids 50 percent of the time – that’s in our divorce agreement. He’s very accommodating of what my travel schedule is. And basically, you get on a plane, you go to a hotel, you’re hanging out in the hotel, you go play poker, hopefully it takes you seven days because that means you won. Sometimes it takes you an hour and you get back on the plane and you come home early. Look, it’s a lot of fun and it affords me a very nice lifestyle, I have incredibly good friends on the tour and basically that’s what you’re doing is hanging out with your friends and working in between. You do some online playing as well. Does that make things easier for you? That’s incredibly convenient for me. Before I ever got associated with UltimateBet.com, there were a couple of online sites already and when I had my third child, online poker was kind of in it’s infancy, but there was some available. I had a baby, it wasn’t like I was leaving the house and it was a complete revelation to me that I could sit in the house with my baby in the bouncy chair sleeping and play poker on the computer while she was napping. Now, I put the kids to bed, I read them their stories, put them in their jammies, get them to sleep and I can go into the bedroom and fire up my laptop and I get to play poker and I don’t have to leave the house to do it. For my situation, that’s incredible. I never turn on the computer when my kids are awake. It affords me an incredible freedom. When you are online, do people know they are playing against you? It depends on which name I use. I’ve got an account that’s “Annie Duke” and I play under that sometimes and people know and then sometimes I like to play in private, only because when I go online under my own name, it’s 200 people trying to chat at me at once. I don’t play poker for big dollar amounts online when I’m playing under my own name because it’s very difficult for me to concentrate on the game when I’m trying to respond to everyone asking me questions. In your book, you talk about growing up in a competitive household where card playing was prominent. Do you play card games with your four kids? No, I’m not sure I have a full deck in my house. It’s not something that I do at home for fun. It’s kind of an interesting thing, it’s like while I am incredibly grateful for the way I grew up, it was an extremely competitive household, it was all about winning and I guess that I just kind of went the other way. The way that my kids and I hang out is we go to the movies or we go to Disneyland or we sit and read books or we watch Animal Planet. We’re not really a games playing household. I think that’s partially because the emotions I felt when I was growing up, playing card games every night and wanting to win so much. It was incredibly intense emotions for me every night. I always felt like I was losing. And how would you feel if one of them wanted to be a professional poker player? Would you be supportive? As long as they’d gone to college. The thing is that it’s a very high-risk profession to go in because of your likelihood of success at it. There aren’t a lot of people playing poker who are making their living at it. It’s a very complex game to master. And I had the power of an education behind me when I started playing. I had something that I could go back to. I’ll be very honest with them about the pitfalls and the chance of their success, but at the same time, if this was what they really wanted to do and it’s going to make them happy, I’m going to support them 100 percent. You’re probably the most well known female poker player in the world. Is it tough to make it in the poker world as a woman? I don’t think so much anymore, but when I first started playing, I got plenty of harassment. I think when I started playing in Montana, there probably wasn’t a day that went by that I didn’t get called the “C” word at some point. The ranchers in Montana weren’t particularly happy with a mid-twenties girl coming in and taking their money. I never really got upset by it though because I just figured they’re not going to play well against me if that’s how they feel, so I’m probably going to get extra money from them. Are there certain players you like playing against or don’t like playing against? Does it matter to you who is at the table with you? The only thing I don’t like is people who are poor winners and poor losers. They bother me. It’s a game, you’re not going to win every hand and you’re not going to lose every hand either. There’s no reason in the middle of the tournament to celebrate over winning a hand. Save it for when you win and please shake your opponent’s hand first. Let’s talk a little bit about Phil Hellmuth. Obviously, anyone who watched the Tournament of Champions last year saw you take him down head to head. I know you two are friends, but how do you feel playing against him? He behaves very poorly at the table and he’s the first one to admit it. And we all just kind of shrug our shoulders and it’s like, “That’s Phil.” It’s an interesting thing; Mike Matusow is another example of people whose behavior at the table isn’t necessarily supreme. They are very good people and they have very good hearts and we understand where that’s coming from. It’s kind of a lack of self-control with them. Phil behaves that way whether a camera is on him or not. There’s something endearing about that. Interviewed by Joel Murphy, November 2005. Annie Duke: How I raised, folded, bluffed, flirted, cursed and won millions at the World Series of Poker is available in bookstores now. 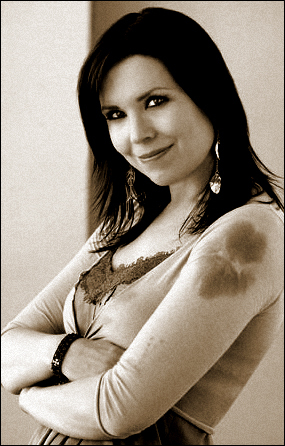 You can find out more about Annie Duke on her website. How can I get information on where to mail/email/contact Ms. Duke? this lady is and idiot to say that no “professional” would win a tournament of 6000, it is because there is a lot of luck involved and it takes a short time to learn the odds and statistics of muti players and the rest is luck. the so called pros are just the ones from history that played the most and had reasonable intellect. with her stupid analogy comparing poker to golf, many golf tournaments are opens, which means open to all that can qualify and the pros still win. the so called poker pros pratically never win anymore because they fade into the odd of even the most rookie players. they now create shows featuring themselves as the best, but the reality is they are just average intelligent people that started before the craze. after, seeing the reasoning ability of annie on the apprentice, it is obvious that her failures to provide a stable 2 parent home for her children extents to failures to be able to accomplish simple business tasks and getting along with others. She and the others on the show do not understand the most basic methods of brainstorming and idea development and just show themselves as incompetents, just because you have a few dollars does not mean your not a loser. I hope your kids can get away from you in time. RELAX! She is NOT an idiot! Have you ever watched the World Series of Poker? She is a very creative person and I contend that you can not blame her personal relationship issues all on her unless you have personal information on the matter. Get ahold of yourself — you are embarrassing. And her kids have no reason to “get away” from her that I know of. If you were actually Joan Rivers, YOU should be ashamed of your behavior and mouth. And your daughter.